ShelterBox staff and response team volunteers are on stand-by after  tsunami-like waves hit the coast around the Sunda Strait and the islands of Sumatra and Java in Indonesia on December 22, 2018. Local authorities report that 281 people have died, 12,000 people have been displaced, and over 600 homes have been damaged, as well as many hotels, shops and boats. The devastation is thought to be caused by Anak Krakatau volcanic activity that created underwater landslides and huge waves. Anak Krakatau volcano is still active and there could be further disasters to come. The Indonesian government is currently managing the disaster and has not called for international assistance. We are speaking to our local contacts in Indonesia, including our Rotary International colleagues, to see how we might be able to help. Indonesia sits on the geologically active Pacific Ring of Fire and is regularly hit by earthquakes. This is the third devastating disaster to hit Indonesia in 2018. Earlier this year, we helped families hit by the earthquakes in Lombok and the earthquake and tsunami in Sulawesi and we are very well placed to help in Indonesia again, if we are needed. We are currently working around the world to provide families with emergency shelter, including in Syria, Somaliland and the Philippines. Money raised will be spent where the need is greatest. On September 28, 2018 a 7.5 magnitude earthquake and tsunami with 20 foot waves devastated the island of Sulawesi. More than 2,100 people died and at least 200,000 people were not able to live in their homes because they are destroyed, damaged, or inaccessible. Nearly 70,000 homes were damaged, as well as schools, offices, and shops. Many families in Sulawesi are in desperate need of emergency shelter and other essential items. As part of the government-led response, we’re working with local Rotary partners and disaster relief teams from the Indonesian National Board for Disaster Management. We are focusing on families living in remote villages in mountainous areas outside the main city of Palu on Sulawesi. These families are vulnerable because they are hard to reach and have been receiving less attention and support. We are providing tents, water filters, carriers, and mosquito nets and are helping communities with training to set up and use the items effectively. So far, 619 families have received aid. Deliveries have been made by helicopter because other routes are blocked due to mudslides and other damage. As the rains intensify, we are providing additional tarps to improve the durability of the tents. These have been procured locally with the help of Rotary will be distributed soon. 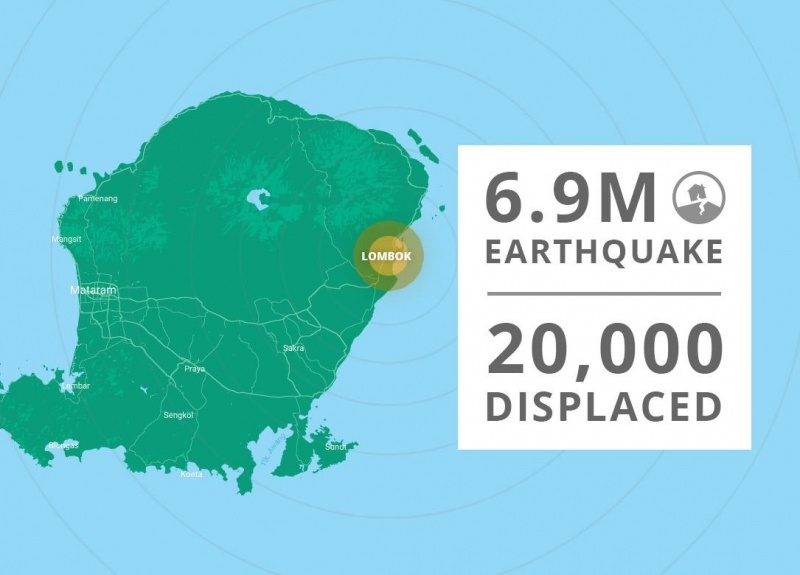 A 6.9 magnitude earthquake hit the island of Lombok on August 5, a significant quake in a series to hit the area that left 20,000 people homeless. The response in Lombok was led by the Indonesian Government. We worked with local Rotary contacts to deliver aid to 584 affected families across North and West Lombok. In addition to providing tents, tarpaulins, ropes, kitchen sets, blankets, ground sheets, mosquito nets, and solar lights, we also provided tents to maternity and postnatal clinics. The single Rotary Club on Lombok worked tirelessly to make our response possible. They provided the contacts, translation, and transportation needed for our Response Teams. When the 6.9 magnitude earthquake hit Lombok, Indonesia in August, Ahmed (far left) and his four children were left without a home. His wife died in the quake and his laundry business was destroyed. Because of support from people like you, ShelterBox and Rotary International provided his family with a large tent, blankets, mosquito nets, and other aid. Ahmed said the items are invaluable to his family and they can now meet their basic needs as they work toward rebuilding their lives.